Rejecting the increasingly complicated intellectual games used by conservative Christians to "protect" the Bible, Enns was conflicted. Is this what God really requires? How could God's plan for divine inspiration mean ignoring what is really written in the Bible? These questions eventually cost Enns his job - but they also opened a new spiritual path for him to follow. The Bible Tells Me So chronicles Enns's spiritual odyssey, how he came to see beyond restrictive doctrine and learned to embrace God's Word as it is actually written. 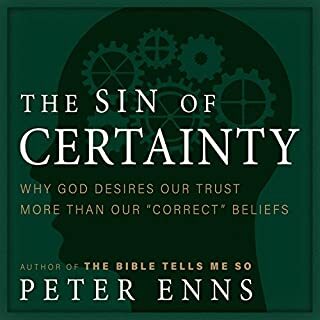 As he explores questions progressive evangelical readers of Scripture commonly face yet fear voicing, Enns reveals that they are the very questions that God wants us to consider - the essence of our spiritual study. The main point of the book is that the modern understanding of Scripture as rule book or guide-book or science book actually changes scripture to something that is different from what early Christians understood and how the writers seem to have intended. 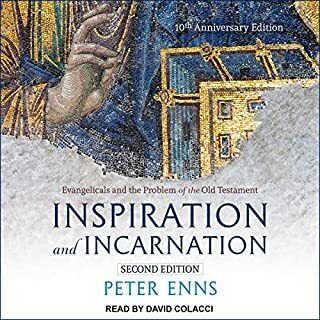 Enns’ main metaphor in Inspiration and Incarnation was that we should think of scripture like we think of Jesus’ incarnation. Jesus is fully human and fully God. Similarly scripture is from God but still human written. When we think of scripture as primarily from God and not written by humans with a particular point then it is easy to have our faith shaken by any threat to scripture. This is why creation is so important for many. Many believe (and I have frequently been told) that if a 7 day literal creation did not occur or the entire world was not covered by water in Noah’s flood, or Jonah was not literally swallowed by a fish then we can’t trust scripture and we can’t trust God. But John Walton has (to me at least) successfully demonstrated that the original author and readers were not talking about the physical creation in Genesis 1 and 2 but the functional creation. The original readers were more interested in why than how. And Walton says they would have all understood Genesis 1 as a temple dedication ceremony where God was creating the earth as a temple for himself so that we as humans could act as his priests and worship him. 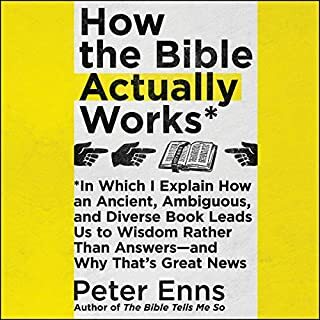 Enns builds on this type of idea and suggests that Genesis and many other parts of the bible that we usually read as history had other intentions. Not because the biblical authors were attempting to trick us as readers, but because they were writing in a different time and culture with different literary conventions that allowed for the molding of a story in ways that were not primarily focused on the history but on the narrative being told. So much of the Old Testament was probably compiled during either David/Solomon’s time or during the Babylonian exile. Genesis and Exodus, Judges, etc. were about creating a national identity (or reminding the people of their identity) more than being a modern conception of history. One point that Enns did not pick up here that I think is important, is that this line of thought is not primarily about minimizing the supernatural as some critics contend. Walton, and I think also Enns, are not against God working supernaturally in the type of ways that are being show in scripture. Instead they think the miracles are about showing God’s power over other deities or the ability to care for Israel more than about the ability to be supernatural. The real strength of the book is Enns’ literary biblical insights. We modern Christians are so used to thinking of scripture as a string of historical narrative that we forget that there are literary allusions throughout scripture. So Matthew has a ton of literary allusions comparing Jesus to Moses (only greater). And there are a number of other subtle allusions to Noah and Creation or the Exodus scattered throughout scripture. These types of insights can only come from biblical scholars that have enough time to study and are a significant reason why we as Christians need to read the bible, but also read about the bible. There are a couple other points that will be controversial to some. First, the New Testament authors use the Old Testament in ways that would have surprised the original authors (and readers) of the OT. Quotes are taken out of context and sometimes altered to support a point. No modern pastor would be allowed to do Biblical interpretation like some of the authors of the NT do and be credible. But Enns suggests (and others scholars agree) that this was a common method in the 1st Century Jewish culture. A second controversial point is that Enns thinks that we should stop trying to harmonize scripture and allow the cacophony of voices to carry through. Not only the different stories of the Gospels or the alternate history of 1 and 2 Samuel and 1 and 2 Chronicle or the alternate creation stories in Genesis 1 and 2 but also the different tones and approaches to God. The pessimistic philosophy of Ecclesiastes does not really mesh well with much of the adoration of Psalms for instance. A third controversial point is Enns’ handling of the genocide of Canaanites. This is over simplifying, but essentially Enns does not believe that the Israelites were told by God to kill everyone. Israel of the time was a tribal community with insiders and outsiders and outsiders were dangerous and to be avoided. So whether the genocide of Canaanites happened or not, Enns is pretty sure that they were not told by God to kill everyone. He is more comfortable with the concept of the taking of the land being Nationalistic myth and not having happened (or not completely in the way described) than a God that calls for genocide. For Enns scripture is not about finding a rule of faith or a model to live by, but designed to give us insight into God, which leads us to a relationship with Jesus. My main complaint is that I wish Enns had specifically spent time on building a case for the role of the Holy Spirit in both the writing of scripture and the interpretation of scripture. That is understood in the background, but not explicit enough. I do not really think that The Bible Tells Me So is for everyone. If you are comfortable with your understanding of scripture, maybe you should skip this. Not because Enns is wrong, but because there is no reason to seek out a crisis of faith. (I am reading a good biography of Jonathan Swift that makes this point, sometimes we don’t need to push ourselves beyond where we are right now.) But if you have been frustrated by either scripture or Christianity as a whole, I think this is a good book that can help you re-imaging what faith can be like and give you a new view of the wonder of scripture. Christianity as a whole and the bible in particular are much bigger and messier than what many modern Christians seem to want to make them. What did you love best about The Bible Tells Me So? I loved the fact that a Christian took seriously the faults of the Bible and didn't try to sugar-coat the truly awful parts. What was one of the most memorable moments of The Bible Tells Me So? 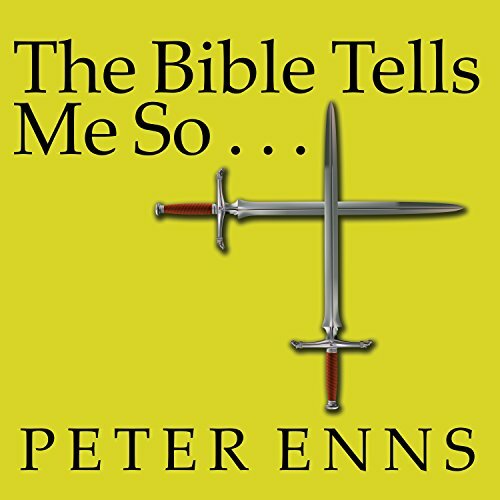 Peter Enns has a great sense of humour and his discussion of the book of Proverbs and his story of how some Christians take the Bible waaay too literally, was great! No, or can't recall. He did an excellent job as narrator. At first I thought it was the voice of the author, he was so convincing. No, over a few days. 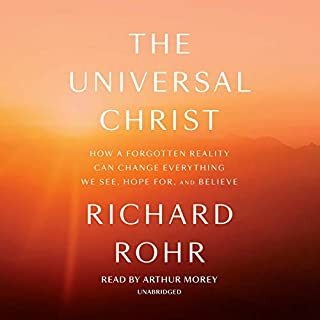 The book left me with some big unanswered questions which I don't think he really addressed, like: "why should I be a Christian and accept the Bible, with all of its flaws as God's truth? Is there a real hell? Are there interpretations that are so wrong that you could be rejected by God?" 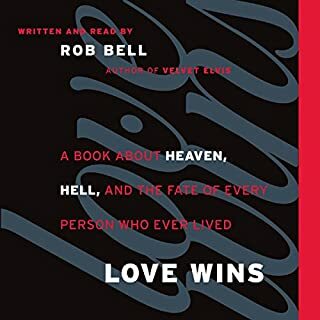 This book kind of stated, (paraphrased) "The Bible has problems, but maybe that's how God wanted it to be and we have to stop expecting it to a perfect book. Humans wrote it and they didn't get everything right. Get over it." I personally think, if the Bible isn't from God, why trust it at all? That makes other sacred scriptures equally valid in my opinion. So as an agnostic, I don't see this book as a reason to re-embrace Christianity. I'm currently reading Marcus Borg to see how that fares. I'm not giving up, and I appreciate Peter Enns' perspective. Most anyone would agree that Peter Enns has an incredible depth of knowledge when it comes to his Bible facts. 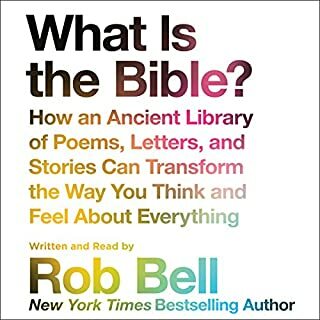 This books takes you into a place where uncertainty about discrepancies of the Bible is "ok." Wrestling with the uncertainties of scriptural facts allows more room for faith than for a dogmatic response to the scriptures. I would call the book a helpful alternative to the lens in which we view the Old Testament though I still find a struggle in that it gives some answers with a certainty that may never truly be as concrete as we'd like. Whether he is wrong or right about how history happened, that's "ok," I can applaud his incredible depth and insight which has allowed me to shift in some of my personal perspectives. Most of the ideas were ideas that I had already arrived at, but the evidence the research and the context that this book provides were amazing!! If you have, do, or ever plan to read the Bible, you owe it to yourself to read this book. As a student of the bible I have often struggles with what is there. Peter Enns is a must read for student, secularist and pastor alike. This was exactly what I needed to help see past my recent "dark night of the soul" -- thank you, Peter Enns! The details, explanations, and even humor clarify so many nagging concerns I've had. If you're 'there' too, then get this book. I plan to purchase the hard copy and also share it with others. The narration of the ebook is whimsicaly good, but Joe had a "breathy -ness" that does take getting used to. It was worth it. Only two things could have made this better. First, if Pete Enns had narrated this himself, the story would have had his own nuances in it. The narrator was good but Pete's subtlety is missing. Second, when he talks about the end of the exile by Jesus, he doesn't elaborate on it to explain that Jesus is ending the exile from the garden, bringing God's kingdom back to the earth, ending the split after the disobedience of the first people there. This is certainly my interpretation of the purpose of Jesus' life, and one that others also believe. But overall it was a great book and one that I enjoyed learning from. Thanks, Pete. For those who left the church or are questioning their faith this book is excellent. I know that in my (former) Evangelical tradition the Bible was treated as though it were Christ. So any inconsistency/inaccuracy meant that the whole faith was invalid. This book does a great job of showing how the Bible is not inerrant but still central to faith in Christ. It uses the Bible, history and sociology to make this point without ever being too dry or scholarly. This is a well written book that anyone can enjoy. Joe Barrett does a great job. He really captures Peter Enns' dry sarcastic humor.